So there’s a debate raging in my house. I’ve just made a brownie and it’s different recipe to the one I normally use. This new recipe comes from a friend who used to work as pastry chef under one of Sydney’s well-known chefs. 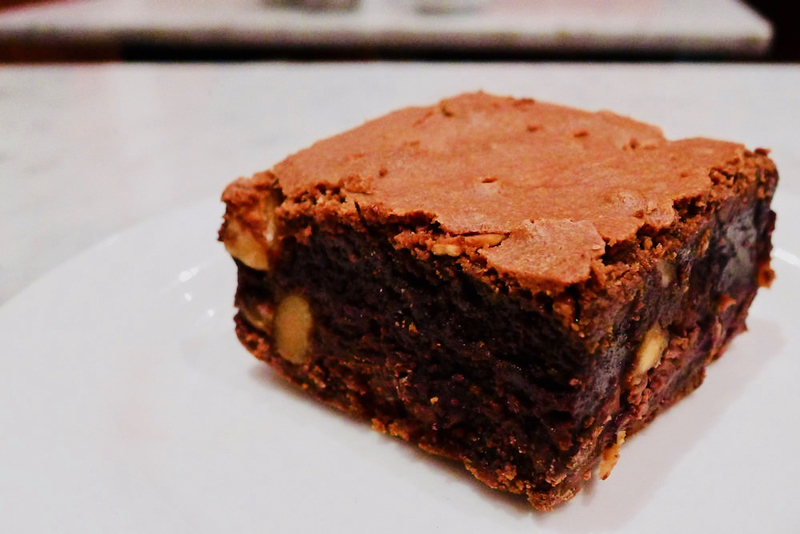 This friend has been making these brownies since forever and they always look incredible but I never tried making them because the recipe was always so large – 10 eggs large. These ladies are working large-scale tray bakes here for the hungry cafe-goers of Sydney but I’m looking for something more humble in size so I had to divide everything by 5. The recipe is simple enough; no softened butter or creaming required, no difficult techniques, no crazy quantities of chocolate. And with the simplicity of this recipe, compared to my usual one, I’m tending towards this one as my new go-to brownie recipe. It’s rich and sweet, and not overly dense or fudgy but perfectly light and with a more sugary crumb. It only needs a dusting of icing sugar to make it look amazing. But some of us aren’t convinced that this recipe tops the old one. They claim it “tastes like a brownie you’d buy at a cafe” and “not as rich” as the old one. But how is that a bad thing? Either way, I’m certain it’s a winning recipe and I’m happy to share it with you. I made it without nuts, but put them if you like and I also would double the recipe. The amount below makes enough for one square-tinned bake, no more than about 1 inch in height which was a little flat for our greedy faces. But it could be the perfect amount if it’s only two of you. Or one. But how ever much you make, always use dark chocolate, the best you can afford and the darkest cocoa you can find. In a bowl, mix the sugar and cocoa with a whisk. Stir in melted butter and eggs, mixing till shiny and smooth. Fold in the flour and nuts. Pour into pan and bake. Depending on your oven, it could take 20-30 minutes. You want a just-set middle, and sides that are cracking and pulling in at the edge.